What events does the add-on track? Google Analytics Enhanced Ecommerce is a professional solution for CS-Cart store owners which allows tracking some additional information about your customers, like when customers added items to cart, started the checkout process, completed a purchase, and many more. Besides, everything in reports is customizable, it meets your specific analysis needs. You can find what is important for your business. By implementing Enhanced Ecommerce, you get more data and more insight, and that will give you more opportunity for improvements. Implementing Enhanced Ecommerce is quite difficult and risky, especially on the production site with important data. It will definitely require technical skills. With our Google Analytics Enhanced Ecommerce add-on, you won’t need to worry about that. All you need to do is simply install the add-on, get a Tracking id from Google Analytics and enjoy using all the useful features of Enhanced Ecommerce. To learn more about Enhanced Ecommerce, please visit Google Support. 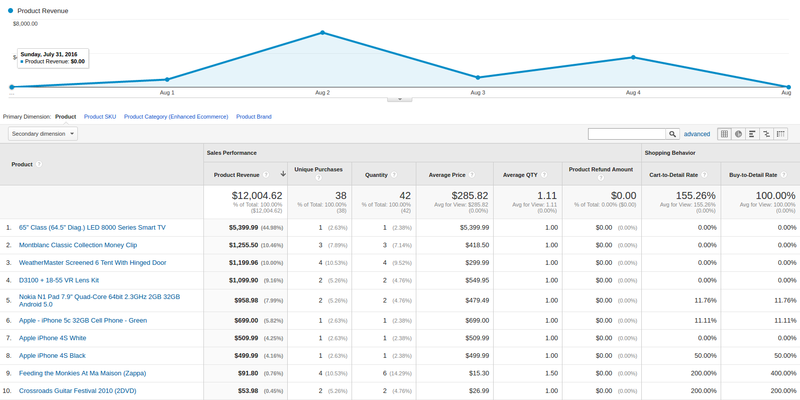 Check out the Google Analytics Enhanced Ecommerce add-on in our demo store. Install the “Google Analytics Enhanced Ecommerce” add-on on the add-ons list page (“Add-ons” → ”Manage add-ons”). Click the + button in the top right corner, select an archive and click Upload & install. You can now find the installed add-on in the list of installed add-ons, just make sure it is set to Active. 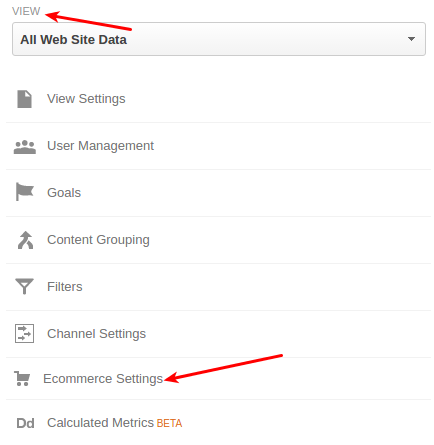 For the correct operation of the Google Analytics Enhanced Ecommerce add-on, disable the Google Analytics add-on. Google Analytics account number—Enter your Tracking ID that you can find under Admin -> Property settings -> Tracking ID. Use as product ID—Define the parameter that will be used as the product identifier in Google Analytics: unique product ID from CS-Cart or its code (SKU). If you use products with options, the code of the corresponding option combination will be used as the unique identifier. If the code is not defined for the option combination, the code of the main store will be used. IP anonymizer—If the setting is enabled, the user’s IP address will be hidden in Google Analytics. Read for more details. Allow vendors to track page views—Allow vendors to track quantity of page views using their Google Analytics accounts. See Additional settings for vendors for more details. Enabling/Disabling non-interactive events helps you control the bounce rate. It allows you to determine how you want bounce rate defined for pages on your site that also include tracking of events, like “product quick view”, “add to comparsion list”, “add to wishlist”, and “buy with one click”. In other words, you can decide whether to consider sessions including only these events to be calculated as bounces or not. Select the checkboxes of events that should not be calculated as bounces. Bounce rate is the percentage of visitors who come to your website and leave without viewing any other pages on your website. In other words, a user comes to a single page on your website and then exits without performing any actions, like product view, banner click, addition to cart, etc. The event that is calculated as bounces by default is viewing products in blocks. It concerns the products displayed in the blocks, like “Hot deals”, “Sale”, “Similar products”, “At the same price”, etc. It means that if the customer visits a store page with such blocks and leaves right away, the bounce rate will be calculated. The product views can still be tracked in the Google Analytics account under Conversions > Ecommerce > Product List Perfomance. For more information on non-interactive events, refer to this article. Enter tracking ID in the Google Analytics account number” field. Note that each vendor will be able to track events related to their own orders and products in their Google Analytics account. For example, if the user adds a product from Vendor 1 to cart, only Vendor 1 and the root admin will see this event. 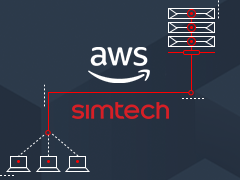 If the user places an order with products from Vendor 1 and Vendor 2, the root admin will see statistics with products from both Vendor 1 and Vendor 2. In this case Vendor 1 will see statistics only with his products and Vendor 2 will see statistics with his. Select the Admin tab at the top of the page. At step 1, Enable Ecommerce, set the status to ON and click Next step. 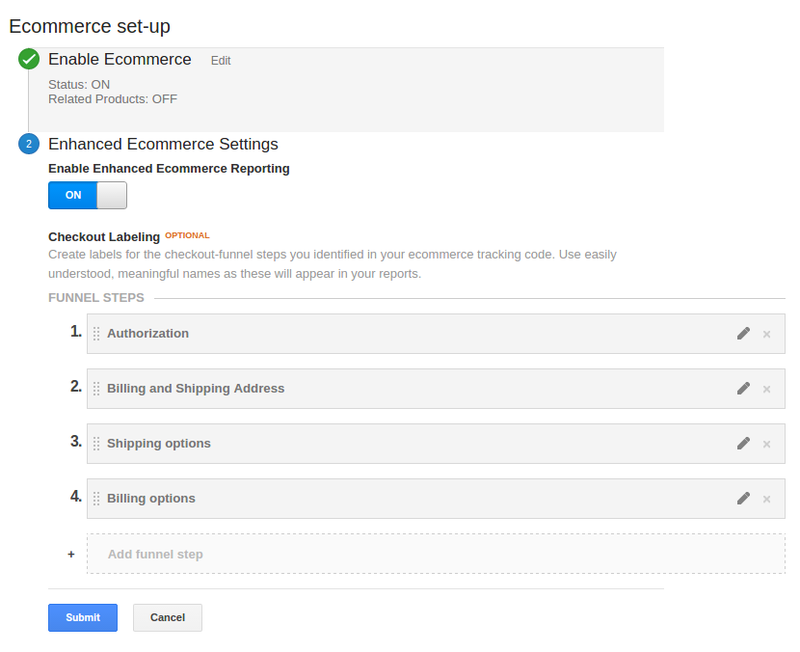 At step 2, Enhanced Ecommerce Settings, set the status to ON. Optionally, you can label the checkout steps. These labels are for display purposes only, so that Analytics can create a meaningful funnel visualization of your checkout path. Before you can access Enhanced Ecommerce reports, you need to enable Enhanced Ecommerce for a view (see the previous section). 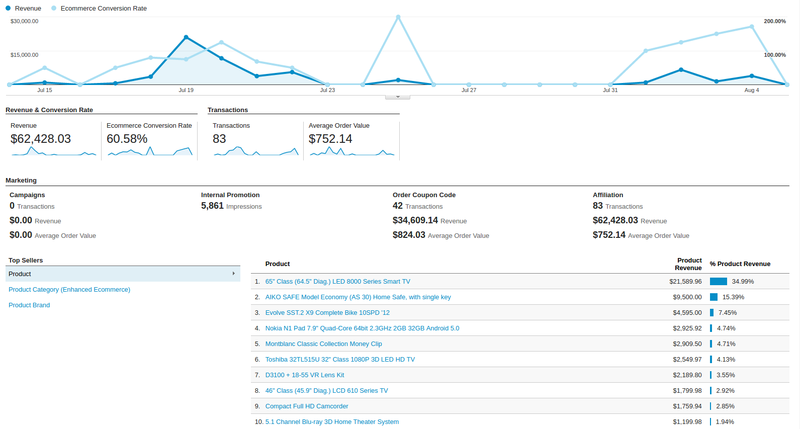 Enhanced Ecommerce reports help you understand performance and activity for individual products or product categories. They also show your customers’ shopping and purchasing behaviors. Like how often they add or remove products from your online shopping carts. Detailed reports about the shopping process can help you in many different ways. Revenue and Conversion Rate: Revenue - the total revenue from web ecommerce or in-app transactions. Depending on your implementation, this can include tax and shipping; Ecommerce conversion rate - the percentage of visits that resulted in an e-commerce transaction. Transactions: Transactions - the total number of completed purchases on your site; Average Order Value - average value of transactions. Marketing: the total number of transactions, the total revenue, and the average order value for: Campaigns, Order Coupon Code, Affiliation. 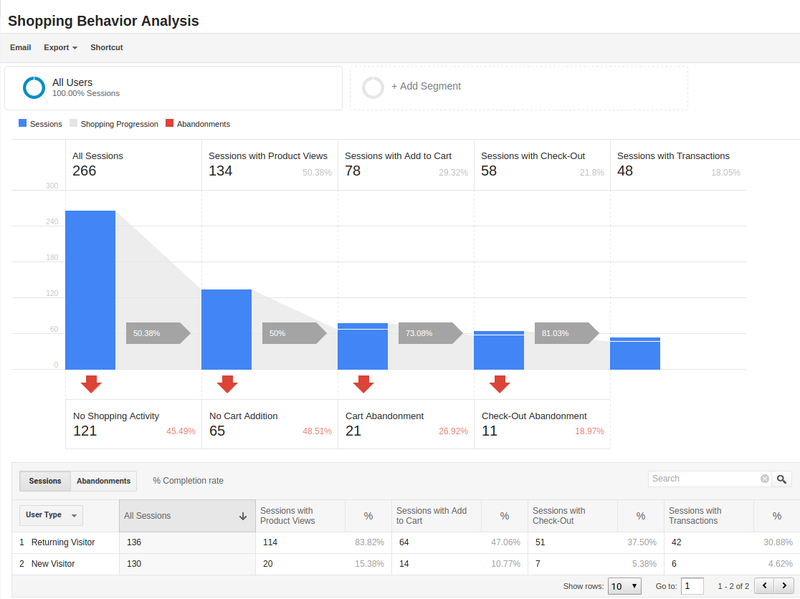 The Shopping Behavior Analysis report allows you to track customers as they walk through your entire sales process. It lets you see the number of sessions that included each stage of your purchase funnel, how many sessions continued from one step to the next, and how many abandoned the funnel at each stage. Where the funnel indicates abandonment (a red arrow at the bottom of a step), those users did not complete any additional steps of the funnel during the same session. Use the funnel visualization to identify strengths and weaknesses in your purchase funnel. You can evaluate your users’ shopping experience from product impression to transaction. This report allows you to analyse the steps in the sales funnel which generated the highest abandonment rates. Based on this information, you can identify the pages with the lowest conversion rates and take possible actions to reduce the friction. 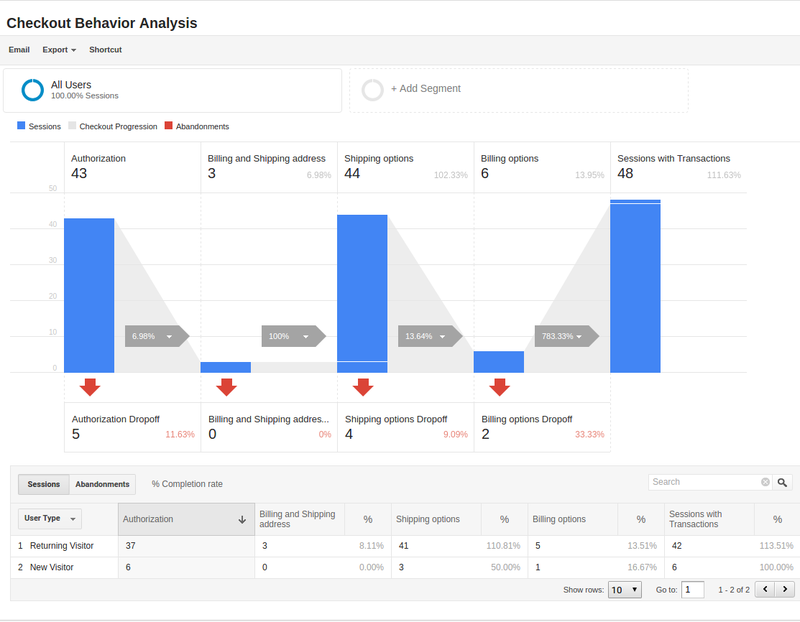 The Checkout Behavior Analysis report lets you see how successfully your users moved through your checkout process. The checkout-funnel visualization illustrates how many users moved on from one step to the next, how many abandoned the process at each step, and how many entered the process at each step. The Checkout Behavior Analysis report gives you a clear overview as to exactly where in the checkout process most of your consumers are leaving. Based on the data you obtain from the report, you get to realize which page is responsible for leaking you money. The Product Performance report shows the sales performance and shopping behavior related to your products. This report offers multiple ways to view the data, such as Product, Product SKU, Product Category, Product Brand. The goal is to let you analyze product performance based on how your company organizes products. The Product List Performance report helps you understand how merchandising blocks, category pages or search results drove product exposure and how often users clicked on specific products. This section provides overview of the ecommerce performance of your internal promotions. Internal promotions are the promotion of your products in your store (Marketing - Promotions in the admin panel). This also concerns ad banners in your store, for instance, an ad banner on your homepage to promote a particular product or a category of products (Marketing - Banners in the admin panel). Internal Promotion Name is the primary dimension. This section provides overview of the ecommerce performance of your promotions via order-level coupons. You can view or create new order coupons in the Marketing - Promotions section. Order Coupon Code is the primary dimension. This section provides overview of the ecommerce performance of your external promotions via affiliate websites.